The not-so-big beasts benefitted as well. Forecast 5 was back for its second successive year and the 320+ visitors to the stand were 50% up on 2016. Jonathan Kipps, the UK distributor for the financial forecasting software and his wife Juliet, Geof Nightingale, who developed Forecast 5 in New Zealand and Chris Riley, their technical advisor, were elated after a solid two days of demonstrating the program. 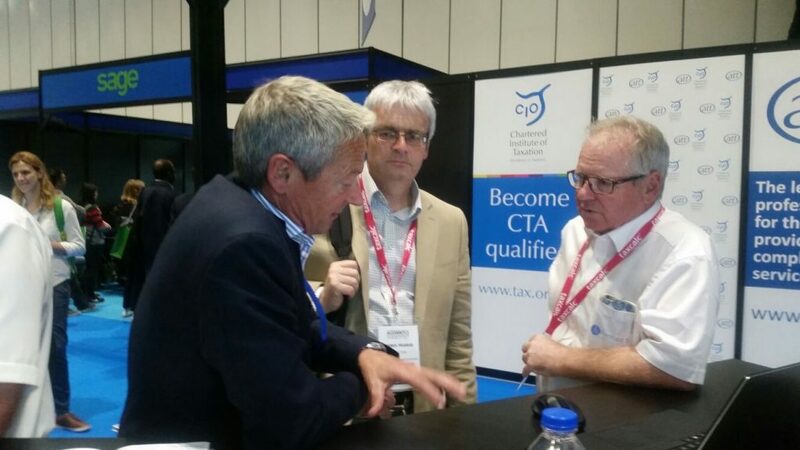 Network specialist, Chris Riley discussing Forecast 5 with two visitors whilst Jonathan Kipps, UK Distributor, considers a question. 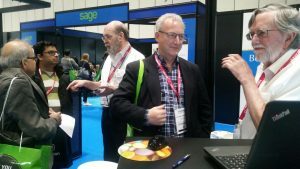 Geof Nightingale, one-time Winforecast distributor for New Zealand, developed Forecast 5 expressly to replace the product Sage stopped supporting 5 years ago. He has taken it considerably further than its predecessor. Forecast 5 which produces an integrated suite of forecast financial reports (cashflow, profit and loss, balance sheet and funds flow statements) is now integrated with Xero, Sage50, Sage300, MYOB EXO and integration with SAP Business One is being finalized. Integration will allow a budget to be created from the selected accounting system, users to prepare next year’s budgets and report actuals going forward month by month into Forecast 5 to create rolling forecasts. “Many of the visitors used Excel for forecasting: which is fine if you are a small company or are looking for a simple cashflow but becomes very cumbersome for bigger forecasts and a great breeding ground for errors. 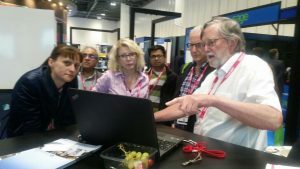 Our visitors were delighted to find how fast and flexible Forecast 5 is: and as it also integrates with Excel it is simple to import existing figures from Excel and access the extensive menu of modelling features available in Forecast 5,” Kipps said. People visiting the stand came from all over the UK, many from Wales and Scotland and from as far afield as Greece and Germany. One visitor from Sao Paolo in Brazil, wants to translate Forecast 5 into Portuguese… another from Largs offered to sail across to the Isle of Man to come and chat about it.